We are preparing to delve into the world of homeschooling this year. We’ve felt the need to homeschool for years but were never in a position to be able to until now. So we won’t have the hustle and bustle of trying to get out the door in time to meet the bus this year. However, that doesn’t mean there won’t be mornings that we need to get in the car and go somewhere earlier and in more of a rush than I’d like- especially since it’s a 40 minute drive from our little village to get anywhere. On those mornings it’s SO nice to have a breakfast that I can put into containers or baggies so we can eat it in the car. And it’s even nicer to know that this “fast food” is homemade instead of processed and super unhealthy. Try to get that out of the little packages of muffins from the store! 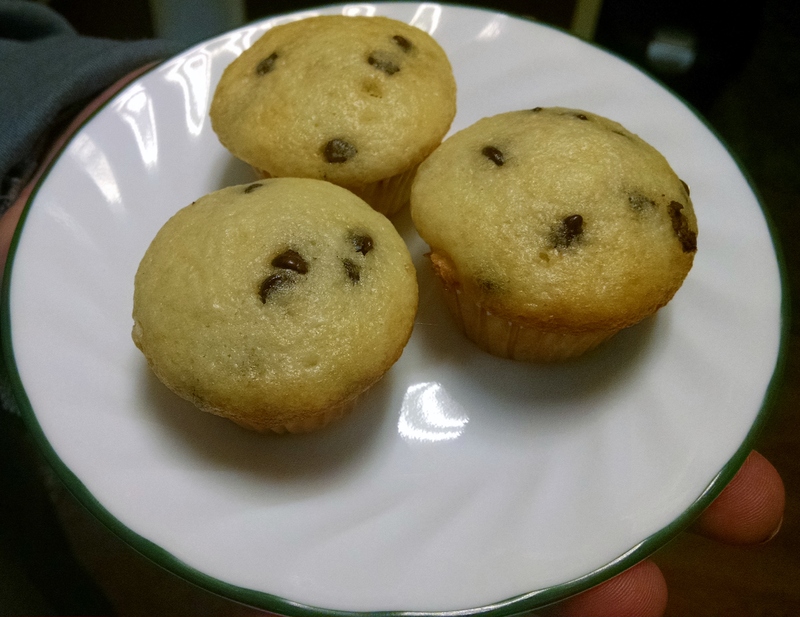 Since I like to make these as easy to eat as possible, I tend to make these into mini muffins. They’re easily popable that way and the crumbs are kept to a minimum. They are just as tasty as regular muffins, so use whatever kind of pan strikes your fancy. And speaking of fancy, these make great baby bundt cakes! You can ice them with a simple glaze and presto- you’ve got a pretty little dessert! It doesn’t get much easier than that! 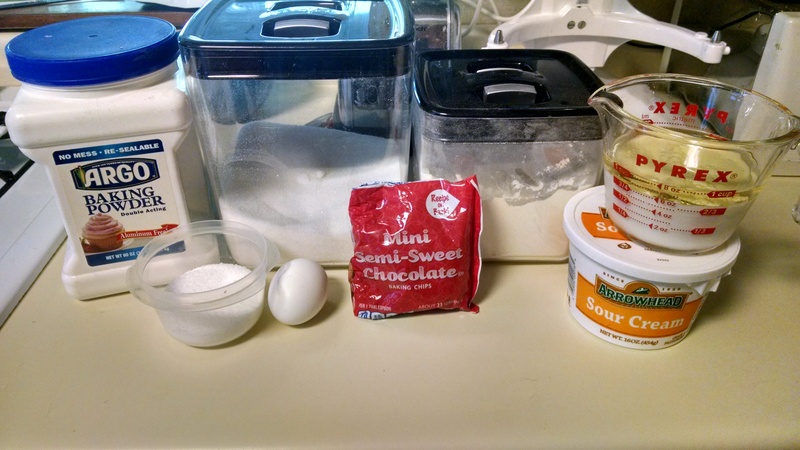 From start to finish these muffins take about 20 minutes (depending on what size you make them). And if you don’t want chocolate chips in them, no problem; use whatever you like. Peanut butter chips (or half chocolate chips, half peanut butter chips), toffee chips, mint chocolate chips, dried fruit, your imagination is the only limit! Oh- and if you really want to make these a little decadent, whip up some cream cheese frosting and smear a bit on top of the muffins. That will brighten the dreariest day 🙂 And you can even make a big batch of these and freeze them for later. Then you can just thaw some on the counter overnight and have a quick breakfast in the morning. Or you can put a frozen muffin in your lunch bag and have a tasty treat at midday. 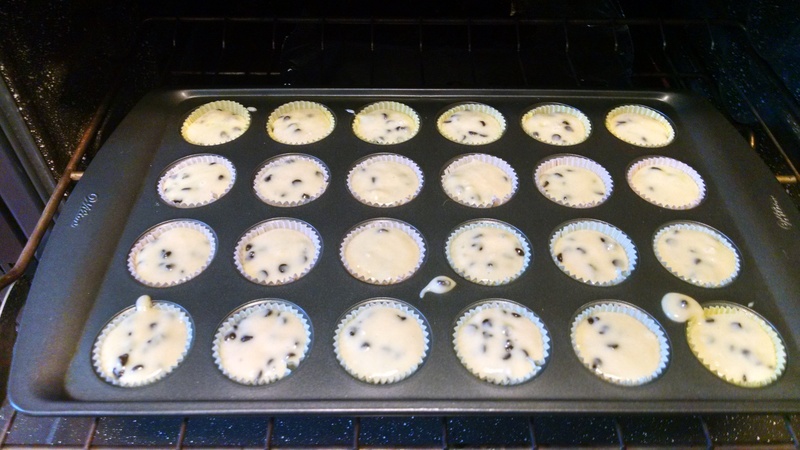 *Prepare your muffin pan by either greasing and flouring each well or lining them with paper cups. 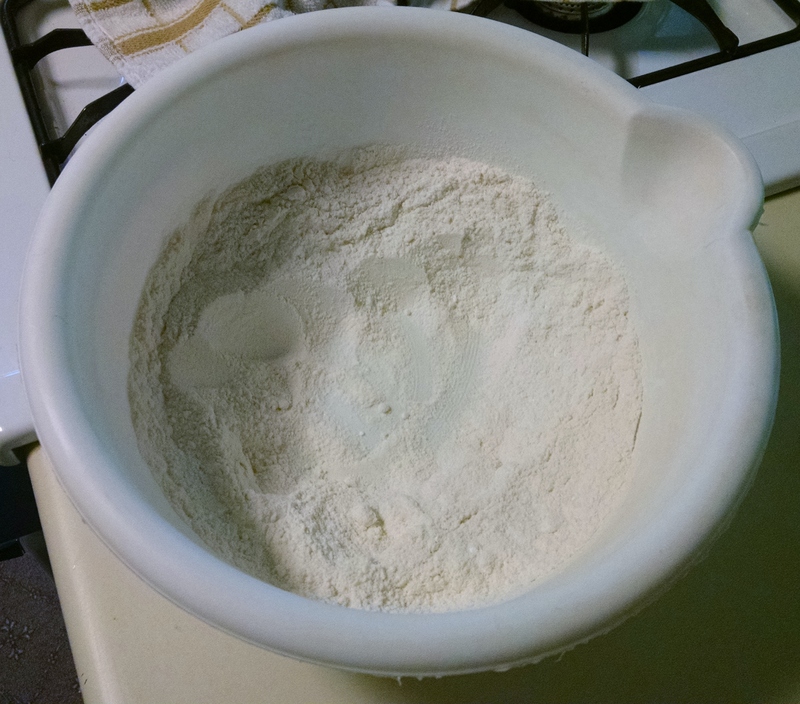 *In a medium bowl, mix all of the dry ingredients. 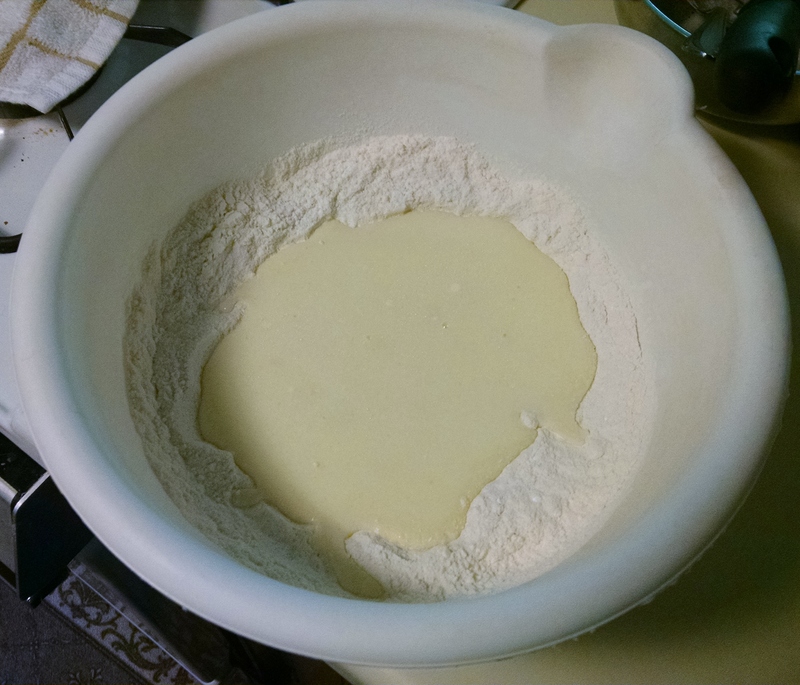 Make a well in the center into which you can pour the wet ingredients. *In a small bowl, whisk together all of the wet ingredients. *Add the wet ingredients to the dry ones and stir until well combined. 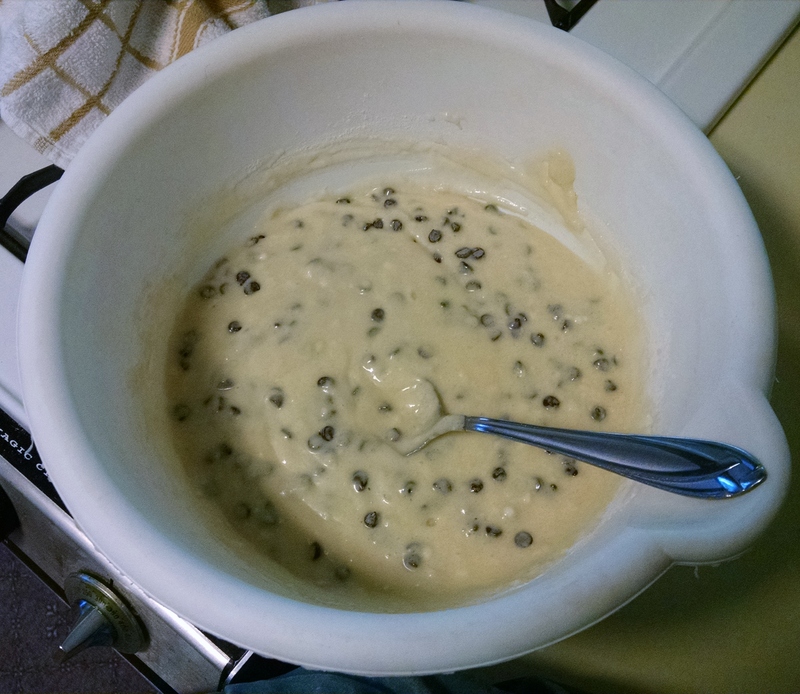 Don’t worry if there are a few lumps in the batter. 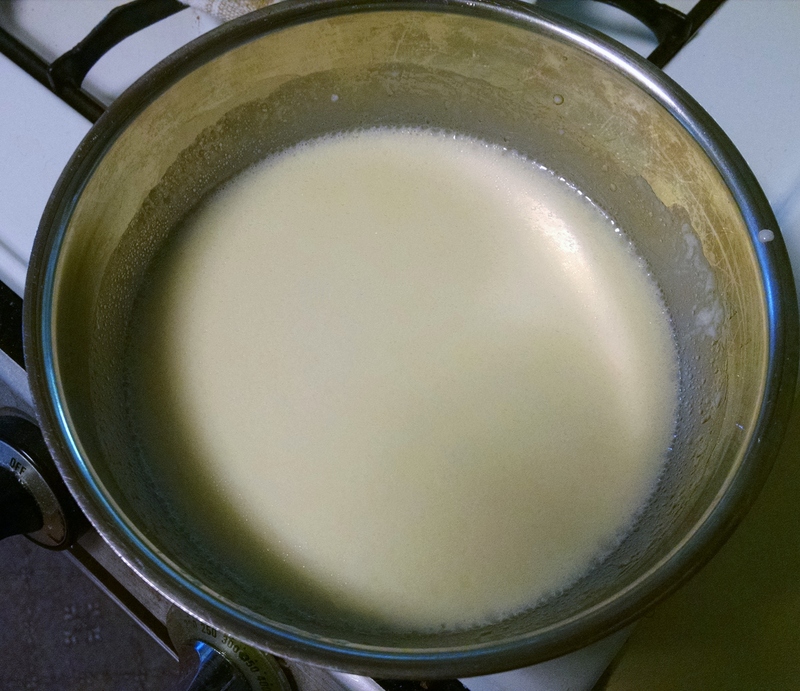 *Scoop the batter into the prepared pan. A small ice cream/cookie scoop works well for mini muffins. *Bake 15-20 minutes or until a toothpick inserted into the center of a muffin comes out clean. *Keep in an airtight container for up to 3 days. Or you can freeze in a zip top bag or well wrapped in plastic wrap and then foil for up to 2 months. The last few days here in Northern Wisconsin have been just heavenly; highs in the low to mid 70’s, a cool breeze all day, and chilly nights to cool the house off to be ready for the next day (saving a ton on the AC bill). This is what I envisioned summers to be up here and I love it! It’s a very welcome break from the unusual heat that’s been hanging around and making a nuisance of itself. And it may return, so I’m going to make the most of these cooler days and get some things made to help when it’s too hot to do any real cooking. 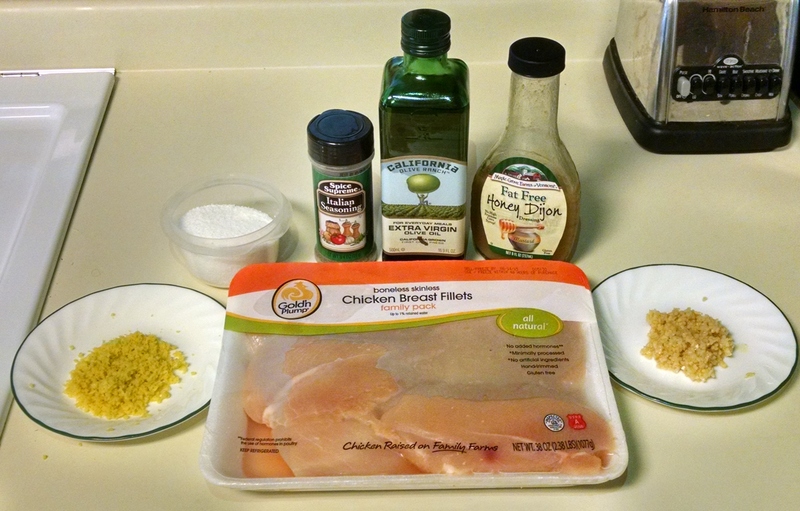 One of the items on that list is lemon garlic chicken breasts. There are 2 huge advantages to this chicken: 1) you can put it in a zip top bag with the marinade ingredients and put the whole thing in the freezer until you’re ready to use it and 2) it’s super versatile, which is always a plus! 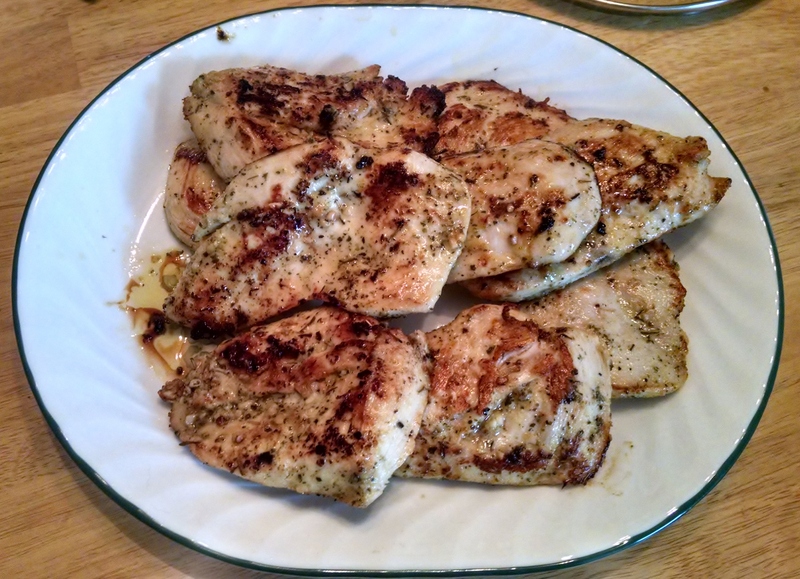 These chicken breasts can be served just as they are with some sides, they can be sliced and put over salad veggies, they can be made into a sandwich, or they can even be chopped up and made into a creamy, garlicky chicken salad with just a hint of zing from the lemon zest. They’re fantastic year round, but they definitely hold a special place in my summer line up! Yes; that is honey mustard salad dressing- and it can be any brand. When toying with the marinade the first time I made this chicken I found something really lacking in the flavor. I stood at the fridge after dinner that night, searching for something to add and my eyes settled on a bottle of honey mustard and the light bulb went off. I added some the next time I made this dish and it solved the problem perfectly! So the salad dressing is optional; the flavor doesn’t stand out in the finished dish. But there is definitely a lack of *pop* in the dish when the honey mustard is left out. See? Super easy! Don’t worry about making the two slices exactly even- you won’t be able to. What you’re going for is two cutlets of comparable thickness so they cook evenly. It’s not brain surgery, so don’t fret if things aren’t perfect. So now that you have the hard part done, I’ll give an explanation of why I have lemon zest in that picture up there instead of the juice. Did you know that the acid in lemon juice actually cooks meat instead of marinating it? It’s true. If you look up the recipe for ceviche (a popular Latin American dish of raw shrimp or fish with herbs and spices) you’ll see that the dish isn’t cooked in any way except by the citrus juice it’s steeped in. That citrus juice does the same thing to any other meat you put it on. 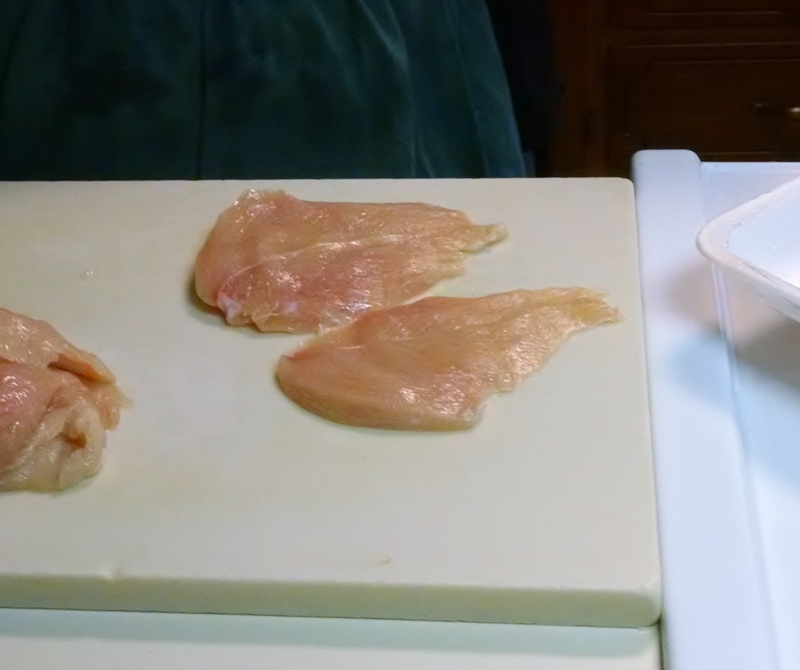 With chicken that results in tougher meat that needs more tenderizer (basically salt) in the marinade. The easy fix for that is to use the zest instead of the juice of whatever citrus fruit you’re wanting to use. And aside from not cooking the meat, I prefer the zest to the juice because of how much more flavor you get from the oil in the zest. But certainly don’t throw the juice away! Zest your fruit then juice it and pour that juice into an ice tray. I put one tablespoon of juice into each compartment of an ice tray and when I need “1 tablespoon of juice” here or “2 tablespoons of juice” there I have them ready and waiting in the freezer. Very handy! Next you’re ready to put all of this together. Whisk all of the marinade ingredients together and make your decision: cook the chicken today or freeze it for another time? If you want to cook the chicken today, pour the marinade over the breast slices in a pan or large bowl, cover with plastic, and put it in the fridge for up to about 8 hours. If you want to put the chicken in the freezer for another day, put everything in a zip top bag, squeeze out as much air as you can, seal it, and into the freezer it goes! One bonus of freezing meat in marinade is that as it thaws the meat draws in more of the marinade and is more flavorful overall. 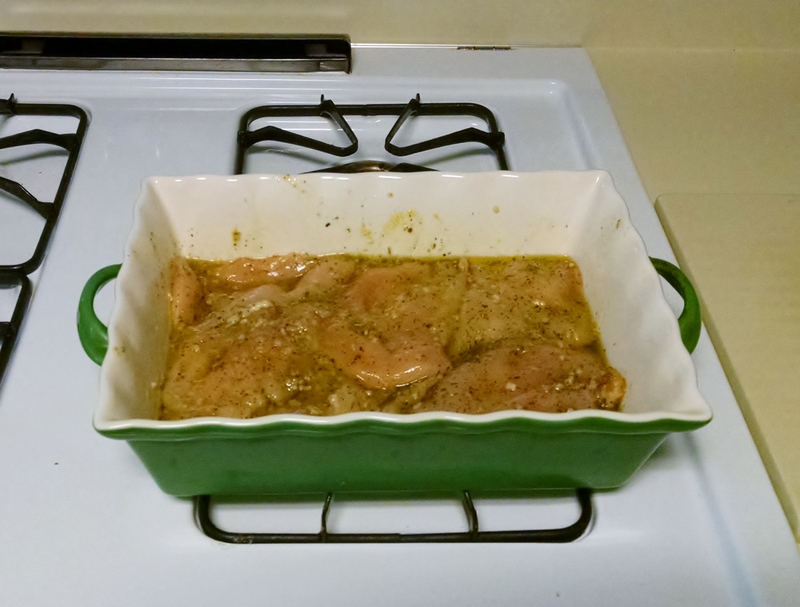 Let 6 hours or so pass…..
Now that your chicken has marinated properly, it’s time to cook it! We don’t have a grill just yet 😦 I’m bummed about that, but the fact that the other things we’ve had to spend our money on are for a house that we own makes up for it 🙂 So if you have a grill or a fire pit (you can read more about easily cooking over an open fire here) by all means, use it!! 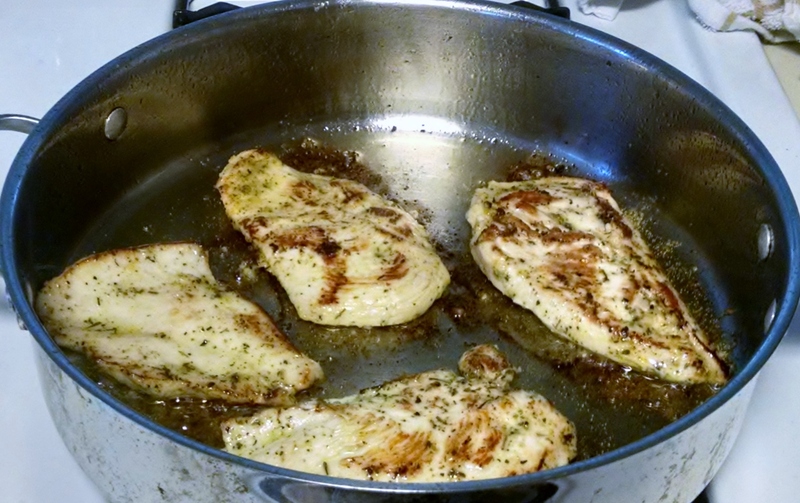 But if, like me, you have to pan fry your chicken that’s ok; it still turns out wonderful! Put your pan over medium heat and add just enough oil to cover the bottom. Since the marinade already has a good amount of oil in it, you’re just taking out a little insurance that the chicken won’t stick to the pan. If you’re using a non-stick pan you can forgo the extra oil all together. Once the oil shimmers, remove your chicken from the marinade and put it in to cook for 4-5 minutes. Carefully flip the chicken over and cook 3-4 minutes on the other side. You want to make sure that the chicken is cooked through and also that it has a nice bit of browning on it. Once the chicken is done cooking, remove it to a platter and cover it with foil to rest for at least 5 minutes before serving to let the juices redistribute. If you couldn’t fit all of the chicken into the pan the first time around, go ahead and finish cooking the rest. Just make sure all of the meat has a chance to rest before serving. 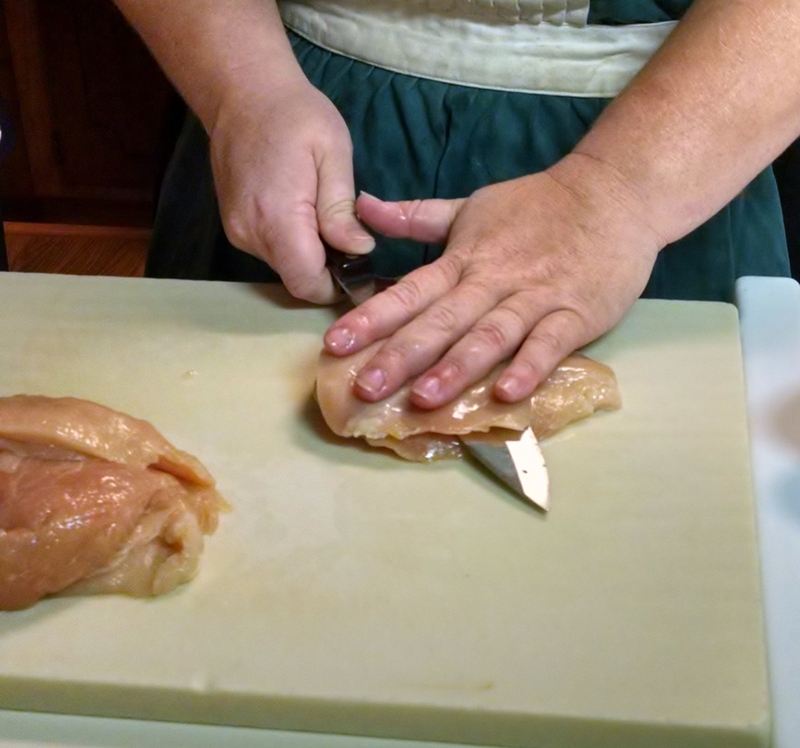 *If needed, slice the chicken breasts into cutlets by running your knife horizontally through the chicken breasts lengthwise. *In a bowl, combine the rest of the ingredients and whisk well. *Put the chicken in a bowl or baking dish large enough to hold everything. Alternatively, you could put the chicken and marinade in a zip top bag and seal it. *If making this dish for a later date, squeeze as much air as possible out of the zip top bag, seal, label, and put in the freezer for up to 2 months. *If you plan to serve the chicken the same day, simply put it in the refrigerator to marinate for up to 8 hours. I usually do about 6 hours and it turns out perfect. The full 8 hours gives a stronger flavor. Take care in going past that though; the flavor gets overpowering. *When ready to cook the chicken, grilling is preferable however not always accessible. To pan fry, heat a large frying pan over medium heat, covering the bottom with oil. *Once the oil shimmers, add a few pieces of the chicken to the pan. Be careful not to overcrowd the pan. *Cook on the first side for 4-5 minutes, depending on the thickness of your chicken cutlets. *Carefully turn the chicken over and cook for another 3-4 minutes. *Remove the chicken to a foil covered platter and let rest while the next batch cooks. 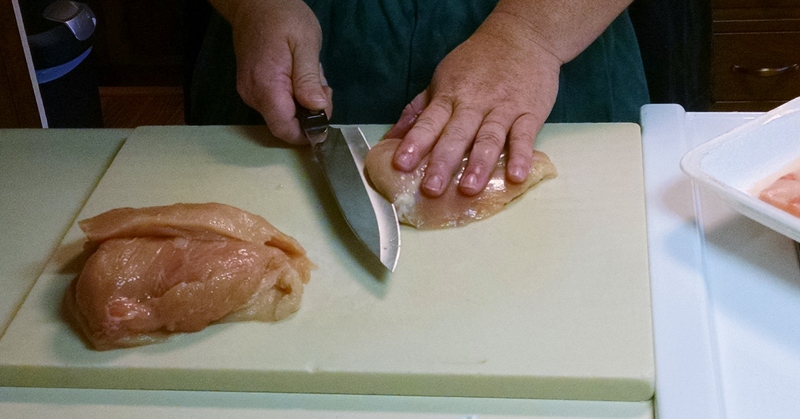 *Make sure all of the cutlets get at least a few minutes to rest before serving.